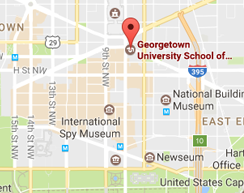 Following seven weeks of online coursework, the first cohort for the executive master’s in Global Strategic Communications (GSC) program gathered in Washington, D.C., for a weeklong residency. Throughout the intense six days, program participants learned from 15 guest speakers, four site visits, real-world case studies, faculty members, and fellow classmates. Each of these experiences reinforced the overarching theme of the week: Global Leadership and Communications. 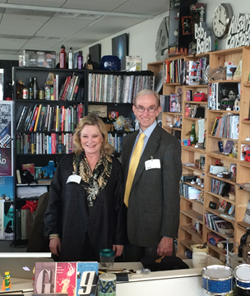 Faculty members Bruce Harrison and Judith Muhlberg stop by Tiny Desk during a tour of NPR. A highlight for students was the ability to learn from and network with top communicators in leading global organizations. The impressive guest speaker list featured CCOs from General Motors, Deloitte, General Electric, and Cargill, to name a few. In addition, students met with communication leaders at National Geographic, NPR, Gallup, and Edelman in each organization’s respective Washington, D.C., headquarters. At the end of the week, participants were able to apply their learning through case study presentations and a crisis simulation. For the presentations, students took an in-depth examination into two classic communication case studies: the Ford/Firestone tire controversy and the BP gulf oil spill. Using frameworks they learned during the module, students created recommendations on alternative ways to approach each scenario. During the crisis simulation, students were tested on their ability to quickly receive information and respond to a building crisis within a fictitious organization. Alan Bjerga, a reporter from Bloomberg News, and Holly Campbell, a communications professional, participated in the simulation, providing students with feedback on their media interactions and their handling of a press conference during the exercise. 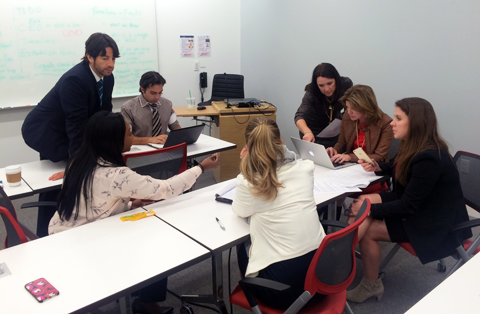 GSC students brainstorm communications strategies during the crisis simulation. The week finished with a workshop on presentation skills and an introduction to executive coaching, which is a hallmark feature of the GSC program. Next up for students is Module 2, which focuses on engaging diverse stakeholders and includes a residency in London, UK.